This tea towel didn't do it's job well enough. It wouldn't dry the dishes properly, so it had to go. Or not. I needed a new tea cozy. 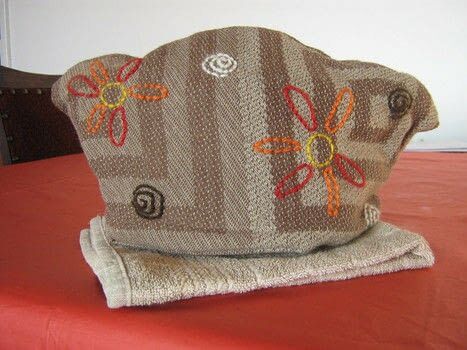 You could make a bottom cozy too, as long as the teapot will still stand upright. However, we just use an old kitchen towel. Fold your tea towel in half. Measure your teapot, roughly, bottom to top, handle to spout. Draw a semi-circle shape on your tea towel with those measurements, cut out and sew the curve. Leave underside open. Fit it onto your teapot with the inside out, if needed pin where you want the cozy to fit better. Do make sure that you can still get the cozy off and take into account that you will pad it, so don't make it too tight. If adjusted, sew along the pins. Use the tea towel as a pattern for your padded lining fabric. Fold the lining in half, put the tea towel on top, cut along the edges and sew the lining closed. Leave a gap for turning. Put the edges of the turning gap inside and close up. Sew the whole way around the bottom to tidy the edge. The cozy itself is now finished. I decorated mine with very simple wool yarn embroidery.